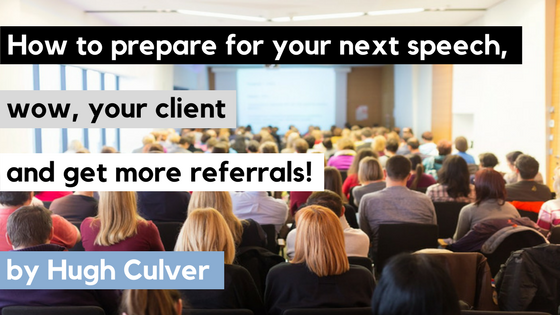 How to prepare for your next speech, wow your client and get more referrals. You’ve been booked to speak. Plans are in place, and there’s nothing to do. Actually, this is the time professional speakers get to work. Sure, you might not have any deliverables due, but you could be planning how to create the best possible experience for your audience and your client. The time to clarify expectations is not the day of the event – it’s at the start of the relationship. Over time, I’ve created a list of possible questions I can pull from when I’m discussing the event with the planning committee. I’m trying to learn about their organization, past events, why they selected me, the agenda and expectations of me. I’ve found the more questions I ask, the more relaxed the conversation becomes and the better the answers. If you’re not sure if you can sell your books, the length of your session or if airport transport is arranged, ask! Your client will be happy to answer your questions – especially if it avoids confusion later. Every event planner wants your introduction, picture, outline, etc. But, remember that event planner is trying to corral materials from a dozen speakers. A simple way to earn brownie points is to be the one speaker who delivers on their promises early. This attitude can extend to the day of your event. For example, if you agree to meet in the hotel lobby at 7:15 AM for an A/V check, be waiting at 7:10 AM. None of these extra efforts are a big deal to you. But they could be to an event planner who’s dealing with a dozen speakers, catering, the A/V crew, and hundreds of other details. If I’m speaking at a corporate event, I typically plan to interview a number of senior managers and staff ahead of time. It makes my speech better, warms up the audience and always impresses my client. Total effort is about 90 minutes. Going the extra mile could be creating a 30-second promotional video, using the event hashtag on social media, giving a copy of your book to VIP’s in the room, or something as simple as remembering the names of the organizing committee. Everyone expects a great speech—what they remember is how you showed up. Public speaking is a profession, but you’re also just one of a rat’s nest of details your planner has to think about. So don’t go AWOL just before you need to be on stage, or at the last minute ask for a WIFI connection (at an event I was speaking at a speaker delayed her presentation for 10 minutes while three technicians tried to get her YouTube videos to play), or decide you want the podium moved off the stage. Your job is to deliver on stage, but also to remove any friction getting there. Want to show up like a real pro? Check in with your client after the event. It could be a quick call, a full debrief with the planning committee or, as a minimum, a small gift and card. It’s an unexpected addition to your service – you might even get some valuable feedback you can use with your next client. As a bonus, I’ve had a number of these debrief phone calls turn into future contracts. And if you worked with a bureau, be sure to share a client testimonial (video is even better) and don’t forget the referrals. Give the gift of eSpeakers for Christmas!